Women in SF&F Month is almost at an end, although it is going to continue into the first week of May. The final guests will end on May 2nd and there were a few more things I wanted to cover before declaring the event officially over as well. Once again, I just wanted to link to what happened last week, any related links I noticed, and announce the final guests! 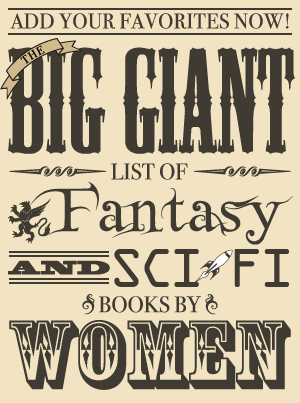 Angie from Angieville shared some of her favorite female writers in the science fiction and fantasy genres ranging from older books to newer books. I immediately went and added all the books she mentioned to my wish list that weren’t already there or were not books I’d already read. Teresa Frohock talked about writing dark fantasy with female characters, including female villains. Ian Sales, curator of SF Mistressworks, discussed what lead up to his decision to start the site and the importance of supporting women who write science fiction. Memory from Stella Matutina wrote about the two women who introduced her to fantasy and her later discovery of more women writing fantasy. Pamela from The Discriminating Fangirl told us about two of her favorite authors and why they are must-reads. Thank you to all of this week’s guests for taking the time to share their thoughts and recommendations! This week there is also another giveaway in addition to Kate Elliott’s books mentioned above. There is a chance to win the entire Newsflesh trilogy (Feed, Deadline, Blackout) by Mira Grant. Be sure to check out the other sites listed in the giveaway post for more chances to win these books! I also wanted to point out a list of non-European based fantasy books written by women that Martha Wells has started. There are so many of these I want to check out!